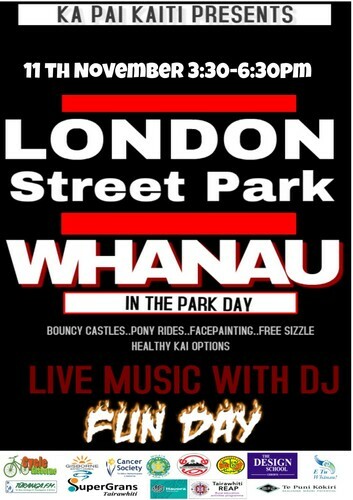 Whanau at the Park is back Friday 11th November at London Street. Meredith Akuhata-Brown will be the MC for the event that will feature entertainment by Jasmine Taare, Calen Broadway, Miss Pou and Joseph Barber. Katrina Duncan of Cycle Gisborne will also be teaching cycle fun and cycle safety, pony rides, train rides. Organiser and Ka Pai Kaiti manager Tuta Ngarimu says the event would not be possible without the strong support from E Tu Whanau, Hauora Tairawhiti and the Gisborne District Council. "I really want to say thanks to all our kind sponsors for there awesome support," he said. "The day is really about the kids and it is always a great day out for the community." The event is alcohol, drug, sugar and fizzy drink free. Next Whanau day will be 25th november at Waikirikiri Park.